Take Your Training To The New Lewel With Polar M450 GPS Bike Computer. SKU: 725882023922. Categories: Our Brands, Polar Watches. SportWatchesTopShops are proud to introduce Polar M450 Cycling Computer, the advanced bike computer with GPS and HRM which includes unique programms that will test, track and improve your physical condition. Orthostatic Test is an easy and reliable test to determine your current fisical condition with Polar M450 Cycling Computer . It shows how your heart rate responds to training and factors such as stress and illness. By repeating the test regularly, you’ll learn what to expect with your heart rate and what can affect it. You can then adjust your training to allow your body to recover when it needs it. If you’re looking to improve your fitness with Polar M450 Cycling Computer and want to keep up to date with how well you’re doing, the smart Fitness Test will tell you exactly what you need to know in just five minutes. By regularly comparing your test results, you can see what progress you are making and how your fitness is improving. Motivating feedback that’s delivered straight to you immediately after exercise is something we can all benefit from. So if you want to know the effect of different training sessions, Polar M450 Cycling Computer will tell you exactly what you need to know. You get a quick overview after each session, and for more detailed feedback, you can either check your training file or you can get further in-depth analysis at flow.polar.com / polarpersonaltrainer.com. OwnCal is the most accurate calorie counter on the market. Polar M450 Cycling Computer calculates the number of calories expended during a training session based on your weight, height, age, gender, your individual maximum heart rate (HRmax) and how hard you’re training. Polar M450 Cycling Computer shows you how your training affects your body and helps you compare the load of different workouts. Continuous monitoring of training load will help you recognise your personal limits and adjust your training intensity and duration according to your targets. Shows you the time necessary for recovery before the next ride. Available on the Polar Flow web service. Track your speed, distance and route with Polar M450 Cycling Computer and its state-of-the-art GPS powered by a fast satellite connection. Heart rate is your most reliable fitness indicator. Monitor your heart rate with Polar M450 Cycling Computer in order to train effectively. Find your limits by following your Training Load and learn how much recovery time is needed after the ride. Available on the Polar Flow web service. 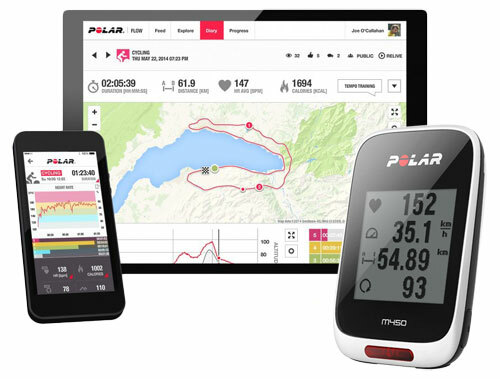 For any additional info about Polar M450 Cycling Computer please contact us on our Contact Page .